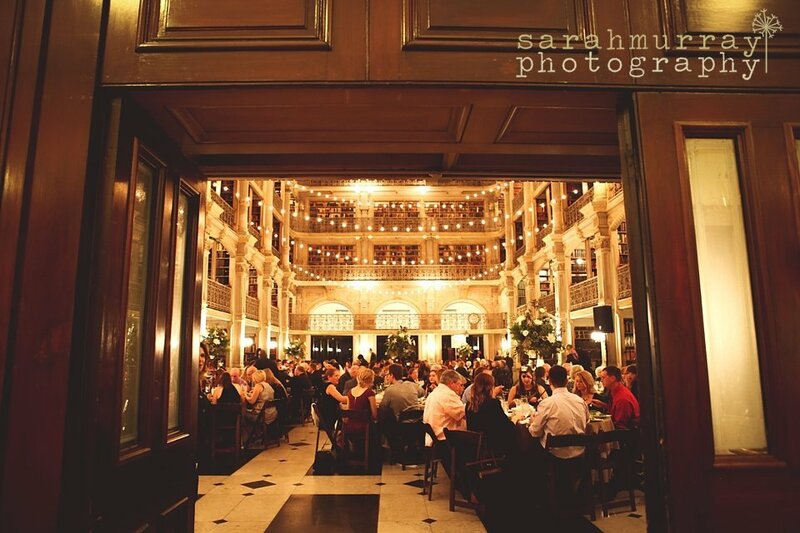 Average base cost for a George Peabody Library wedding is calculated by figuring a 125-person guest list for a 6-hour Saturday ceremony and reception in June using $170/pp for your food/beverage cost. 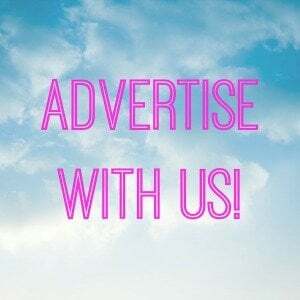 Entertainment, flowers, additional decorations and rentals, DJ, wedding coordinator, and photography are not included. Price is rounded up to the nearest thousand. Gratuity and tax is included. *(Only available when booking a reception). A specific date may be held without a deposit and contract for only one week. A deposit of one-half of the TOTAL rental fee must be made upon the signing of the license agreement. The remaining balance will be due 60 days prior to the event. A refund is only available if there is at least 90 days’ advance notice. The amount refunded is the deposit less 50%. 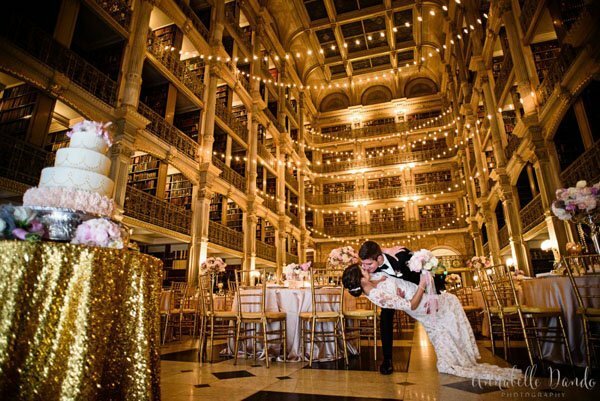 The George Peabody Library requires that all clients purchase liability insurance for the evening. Candles and open flame, balloons, birdseed, potted plants, smoking, bubbles, sparklers, beer kegs, drinking of shots are not allowed. What’s Included: Rental includes one library manager, at least one staff worker and one security guard. Also includes tables and chairs. 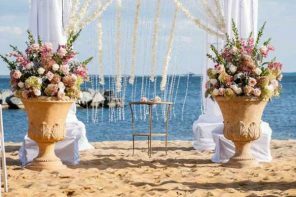 Food/Beverage: You can choose from The Classic Catering People, Charles Levine Caterers, and Occassion Caterers for all food/beverage. 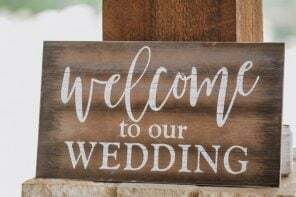 On average you can expect catering costs at this venue to run you between $140 to $180/per person for the menu, full bar, china, glass and silverware, service personnel and linens. Vendors: All vendors must be approved by the Private Events Office. Size: The library will accommodate 200 seated guests and 400 standing. With a dance floor, the space will accommodate up to 170 seated. Bridal Suite: Yes, this room is available for one hour prior to your wedding. Parking: Valet parking is suggest, however you would have to arrange your own. How Will Grandma Get There? The George Peabody Library is centrally located in Mount Vernon, which is just to the North of downtown Baltimore. There are several hotels within easy walking distance (or cab) from the venue, including The Wyndham Baltimore and The Biltmore Suites. Party On! All events must end at or before midnight. The George Peabody Library (which is located within the Peabody Institute of Music, and was formerly known as the Library of the Peabody Institute of the City of Baltimore) first opened in 1878. Designed by Baltimore architect Edmund G. Lind, the non-circulating library (which is part of the Sheridan Libraries Special Collections at Johns Hopkins University) has over 300,000 titles in their collection and is open to the public. 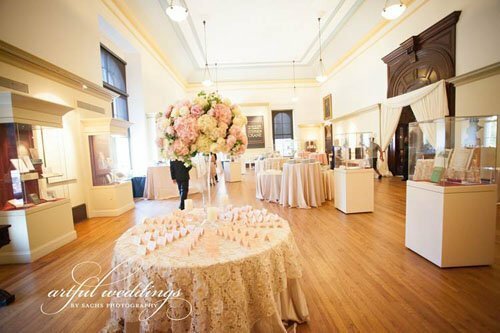 A typical wedding setup might include a ceremony in the Peabody Library, cocktail hour in the Gallery (adjacent to the Library) and reception and dancing in the Peabody. 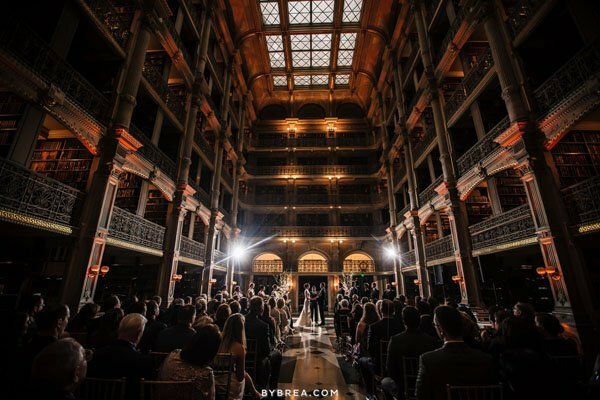 If you’re a Baltimore bride with a larger budget looking for a classic wedding venue that is sure to “Wow,” this is a definite consideration. 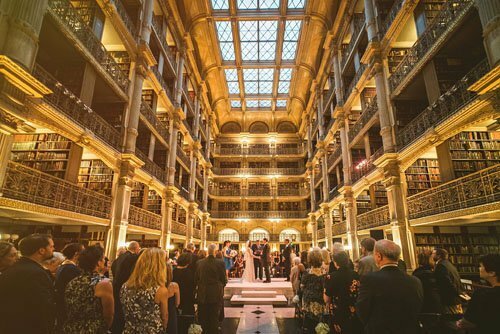 While some of the restrictions at libraries like the George Peabody (like no candles) can be a bummer (as can a bit of a far walk to the restrooms, as brides have reported), those are all worth overlooking once you see how gorgeous the reception space is. 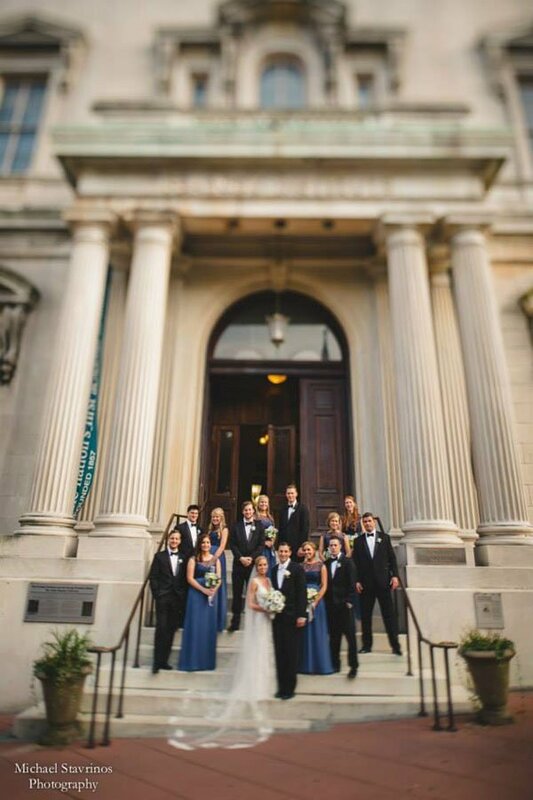 One thing I would HIGHLY recommend is taking your wedding photos BEFORE the ceremony, since your caterer will have very little time flipping the Peabody Library for the reception if you have your ceremony there. 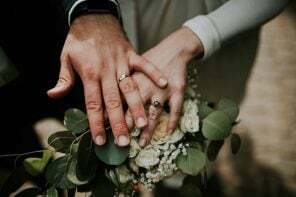 If you love the venue but it’s out of your price range, I would consider having a Friday evening wedding there and also speaking with the approved caterers about your budget and what they might be able to work with. It’s always worth a try! Hi @lovinglibraries! That is included within the initial 4-hour rental period. 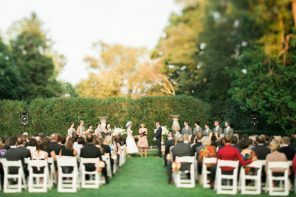 You would most likely want to rent the space for 6 hours, plus the ceremony fee. The updated prices for 2017 reflects both those options now! 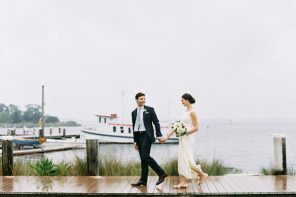 Does the $1000 ceremony fee cover simply having a ceremony in your 4 hour window, or does that amount buy you an extra hour for the ceremony (or any other perks)? 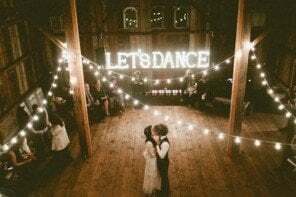 The numbers for each venue are calculated using their facility rental fees and average catering costs from the venue’s exclusive or recommended caterers (in this case it was an average of $150/pp). Then we also include sales tax and gratuity. And that’s it. $33,000 in this case is just for the venue and food/beverage, and that’s a BASE cost. 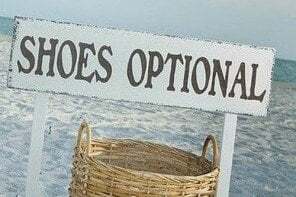 Of course you can go over that, but that is the price that a bride can expect just walking in the door. This is not including decor, photographers, and any other rentals. We’d love any other details you’d want to share in terms of what doubled your cost at this venue…it’s always helpful to readers to see what additional costs above and beyond food and venue rentals are! I’m not sure how you calculated the $33,000 budget, but I can assure you that my numbers for a wedding here are about twice that. It’s a beautiful venue, but having it in the city definitely bumps up the price for everything. 33k would be a very bare bones wedding here!